Whether it's business or pleasure, Lord Robert Carlisle never backs down from a dare. But finding a husband for scandalous Mariah Winslow? It's one challenge he instantly regrets accepting. Even with all his connections**---and rakish charms---**Robert will have to use every trick in the book to marry off a woman with no dowry and no sense of decorum...no matter how stunningly beautiful she is. Mariah Winslow has no intention of being a pawn in Lord Robert's game. She knows he agreed to play matchmaker only to secure a partnership in her father's shipping company, a partnership that's rightfully hers. For now, though, she'll dress for the elegant balls he throws and dance with the eligible bachelors he chooses. But she won't be outwitted by the devil himself**---**no matter how tempting and irresistible she finds him. 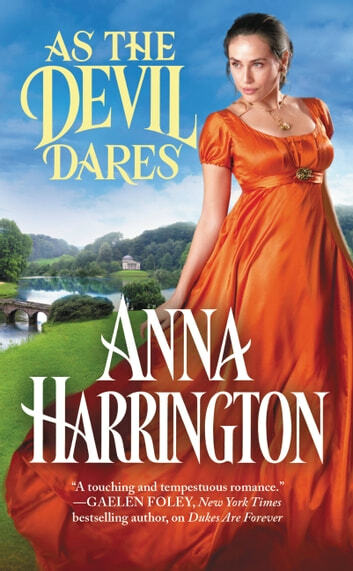 As the Devil Dares by Anna Harrington is book Three in the "Capturing the Carlisles" Series. This is the story of Lord Robert Carlisle and Mariah Winslow. I have read the other books in this series (and Loved them!) but feel this is easily a standalone book. Robert has been building up his wealth and connections for the past two years his main desire is to be a partner in the Winslow Shipping and Trade. Winslow Shipping and Trade is owned and operated by Henry Winslow, it is one of the biggest Merchant shipping company in Britain. One day while talking to Mr. Winslow about what Robert heard that Mr. Winslow might be expanding shipping routes and adding a partner, Robert learns that Mr. Winslow's daughters are a issue for him. Mr. Winslow goes on to say that his daughters, Mariah and Evelyn are in their seven and fifth season and with the oldest Mariah has a nickname 'The Hellion'. While talking 'The Hellion' was heard to be racing down the street with her sister by her side. Mr. Winslow turns to Robert and reports if Robert can find a respectable Gentleman by the last day of Parliament (about 7 months) to Marry Mariah, that he will give Robert a 20% partnership in his company. That is a deal Robert can't turned down. Mariah had always had hopes of becoming a partner in her father's business and had no real attention of marrying. But when she learns what her father and Robert are doing she doesn't take it well. Both Mariah and Robert where characters that you really enjoyed reading about. They had similar issues with a parents death and feeling responsible for it. I found this book hard to put down! Just Loved it!! A fabulous romance with sparks abounding between these two who think they are against each other! I just adored the banter and antics that Mariah and Robert get into when around the other. Very well written with secrets and humor sprinkled throughout. The story keeps the pages turning because you just want to find out how it could all end happily! The secondary characters are lovable and fit right in. You won’t be sorry with this next Carlisle book! This author knows how to keep you intrigued.